The Mil Moscow Helicopter Plant of Russian Helicopters Holding Company (part of Rostec State Corporation) has finished additional certification trials of the Mi-38 helicopter at extremely low temperatures. Helicopter plant experts confirmed that the aircraft can be maintained, prepared for the flight and operated at the temperatures below -45°С (-49°F). Trials took place at the Mirny airport in Yakutia. The helicopter performed 57 flights; 18 land engine trials were held. The system operability, onboard and emergency equipment performance at low temperatures were tested as well. “The helicopter specifications fully comply with the European CS-29 and American FAR-29 airworthiness codes, but it is possible to expand the rotorcraft potential. 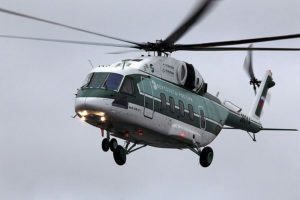 The increased operating temperature range will make the Mi-38 attractive to companies that are engaged in mining in the harsh environment of the Far North, because helicopters are widely used in such projects for cargo and personnel transportation,” said Sergei Romanenko, Executive Director of the Mil Moscow Helicopter Plant. The Mi-38 high-performance helicopter has advanced and reliable systems with integrated onboard equipment. The main elements of the fuselage are made of aluminum alloys and composite materials; joints and other elements are made of steel and titanium. The helicopter’s fuel-efficient engines, advanced frame and high power-to-weight ratio provide for an efficient operation of the rotorcraft, including day and night flights in various climatic and weather conditions.